This baby layette checklist will help you figure out what you need to have for your baby's clothing for the first few weeks. When you read this baby layette list below please understand that this list is general, but will be somewhat dependent upon the weather and season in your area when your baby is born. 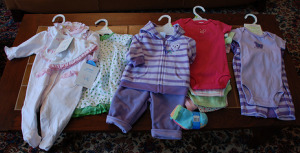 If you have your baby in summer, you won't need the sweaters, for example, and if you have your baby in the winter you may want less t-shirts and more pajamas with feet, for example. You can even get a free printable version of this checklist by scrolling to the bottom of this page for the link! After your first baby you can use this layette checklist just to remind yourself what you need, to dig it out of storage. If you choose disposable diapers you will be using a lot of them, and will need to replenish your supply regularly, so you may want to purchase from a place, like Amazon.com , which can regularly send you diapers as often as you specify.